Turkey Street is an ancient road ‘… just wide enough for two emaciated camels to pass each other unhindered’. Now you can take a stroll along its winding path following in the strappy sandals of Alexander the Great as he tried (and nearly failed) to ‘…wrest old Halicarnassus from the doughty Persians’. But be wary of the ‘…motorcades of Nissan tanks flanked by Vespas on amphetamines’, something Alexander never had to contend with. Turkey Street is now open for business. Relax, open a bottle, kick off your heels and maybe grab the Kleenex. The real strength of Turkey Street though is that at its heart is a genuinely touching love story. Greetings from a wet, blowy Norwich. Oh, to be in Bodrum once again. Nevertheless, Liam and I will be popping open the bubbly later to celebrate. This one’s been a bit of a labour of love. Thank you so much for all the pre-orders and messages of support. I’m chuffed. 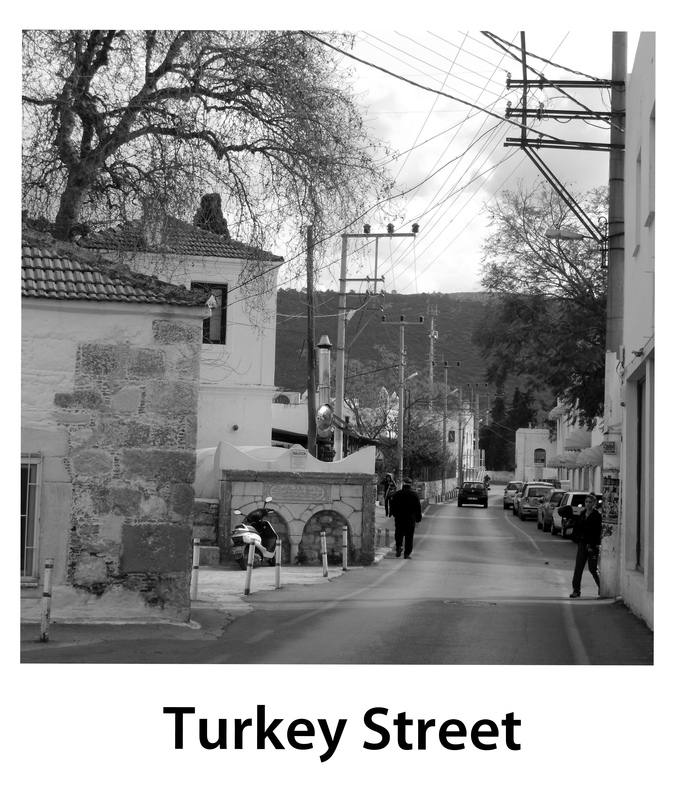 Turkey Street: Jack and Liam move to Bodrum is officially published today. With thanks to Annie from Back to Bodrum for the photo. Ah, how sweet. Thank you. In fact most of the cast are a mix and match of the wide spectrum of people we met along the way, blended together to protect the guilty ;-). Character assassination was never my game, just a desire to shine a little light on expatland. Sometimes it was funny, sometimes touching, sometimes just plain ugly but always fascinating. . . have you considered joining the ‘Wheel-tapper’s and Curtain-twitcher’s Social Club’? Congrats! Can’t wait to read it. I don’t think it’s available in book stores in Istanbul, is it? When I’m in London in June, I will get one for sure. Just went on Amazon to see if I could order this in Canada, I can and have although it has a long shipping time. Just reading the blurb about the book though I can see a movie in the not too distant future…Best Marigold Hotel style! !